You’ve probably seen it, you can’t miss it – Soho has welcomed in the new 68 and Boston! Right beside Bo Drake on Greek Street, 68 and Boston boasts two floors with two completely different personalities. Downstairs at 68, the slick red bar is devoted to affordable wines coming in at £20 a bottle – pretty reasonable in this part of town. 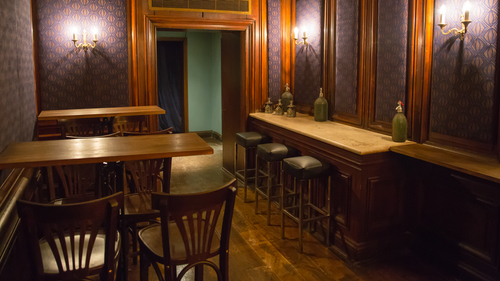 Upstairs at cocktail bar Boston, much like the gilded decor outside, glitters gold with an old fashioned style twisted into modern form, hardwood, sophisticated cerulean walls and gold spread across the slightly labyrinthine venue. The design will immediately strike a Londoner as odd – it’s like someone wedged a City bar into Soho, almost as peculiar and someone wedging Street Feast into Guildhall. Not detracting from the venue itself being beautiful, no – it’s gorgeous. Of course, your mileage may vary on the matter, our table found it all rather odd and slightly forced. 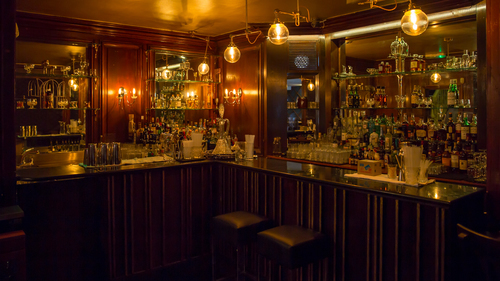 If you are looking for a City bar in Soho’s lively surrounds, though, this would be the spot! 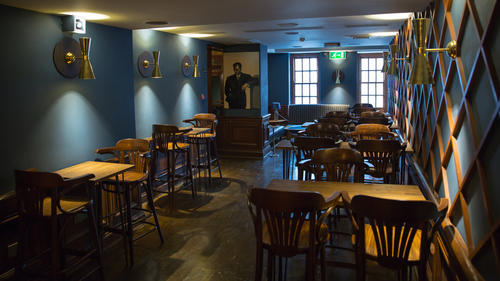 As for the bar, there are some big names involved – President of the UK Bartender’s Guild, Luca Cordiglieri designs along with head bartender, Josh Powell – and the menu reflects that. 2015-2016’s latest trends are immediately visible: more use of wines as vermouths and sherries, longer, lighter serves overall. Before the review, I must point out that this being being a launch, for the staff’s convenience for all the quick rounds of drinks being knocked out one after the other, a restricted menu of 5 cocktails were being served. These are the five reviewed. 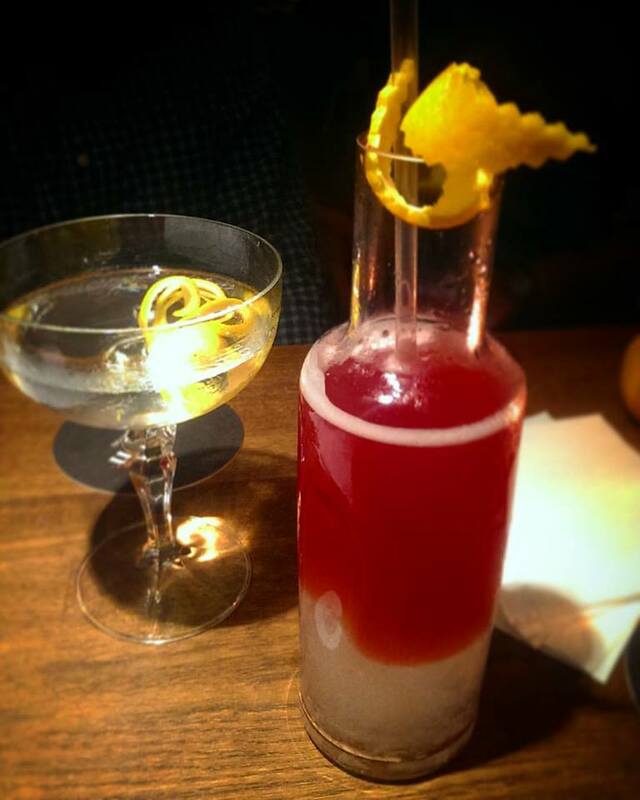 A firm favourite and easily the winning drink of the night really went in for the kill in it’s trendiness. The Loud Tempests mixes Lagavulin with samphire-infused White Port, Benedictine and Abbott’s Bitters. Well balanced, the loud peat of the Lagavulin is toned down, it’s sweetness coming in alongside the powerful samphire, which I’d argue dominates the cocktail. A finish of smoky vanilla, anise and herbs lingers. Relaxed, not attempting too much, the cocktail impresses. The Dazed & Confused rides well with the smoothness of the Absolut Elyx vodka, and bright citrus bitters. This Martini is brought to life by the cardamom infused Cocchi Americano vermouth. Mind you, this is for those who truly not just tolerate, not just enjoy, but relish and delight in cardamom. It’s strong, and it’s not trying to hide it. Personally, it could do with relaxing on that front. A wash of cardamom is welcome, a kick in the teeth with it is another. As long as you enjoy cardamom, this is a novel twist on the vodka Martini. L-R: Dazed & Confused, and the Peace Offering. The next two drinks are ambitious, and the Hoodooist loves their ideas. However, they cocktails have underestimate the strength dry sherries can exert over other flavours in the drink. 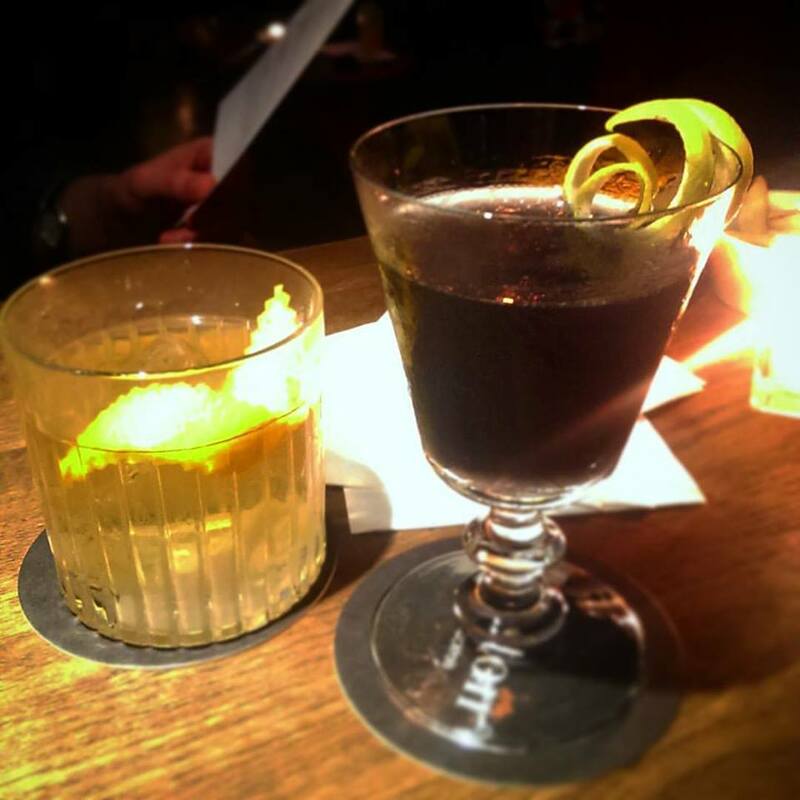 The Squid Ink Martini is better off of the two, with a short list: Tanqueray gin, En Rama Fino sherry, squid ink. The first sip is a briny bite of sea salt from the ink, followed by powerful Fino sherry. If you enjoy Fino, you will enjoy the Squid Ink Martini. Or you could drink Fino sherry. Maybe with salt. Enigmatic and enticing presentation, though. The Trader faces a similar dilemma. Bacardi 8yr, Vanilla and Coffee infused Bacardi Carta Blanca, Amontillado sherry, Triple Sec, lime and pineapple juice, sugar syrup. For a drink with that many ingredients, it all gets lost in a mass of sugar and Amontillado with some pineapple juice. Finally, the Peace Offering was anything but. Olmeca Reposado, Cocchi Torino vermouth, Tempranillo, Agave, unfortunately did not work. The table of seven all rejected it. Like many City bars, Boston appeals in extremes of flavour. We had an enjoyable Merlot and Pinot Grigio downstairs at the 68 wine bar, though. So there are ups to this venue, just downstairs. There are some wonderful ideas here that have a tendency to overkill – luckily, overkill is something easily dealt with with a tweak. Perhaps in our excitement for novelty, it is possible to rush headlong into trends, and overdo some of them, as seen with the powerful sherry flavours dominating entire drinks. At the price these drinks are coming at, though, one would rather wait to see the very possible and easily made changes before shelling out 10-16 pounds for one. Some big talent here I’m wishing the best to! This entry was posted in Bars & Cocktails and tagged Date, Small Groups, Wine.